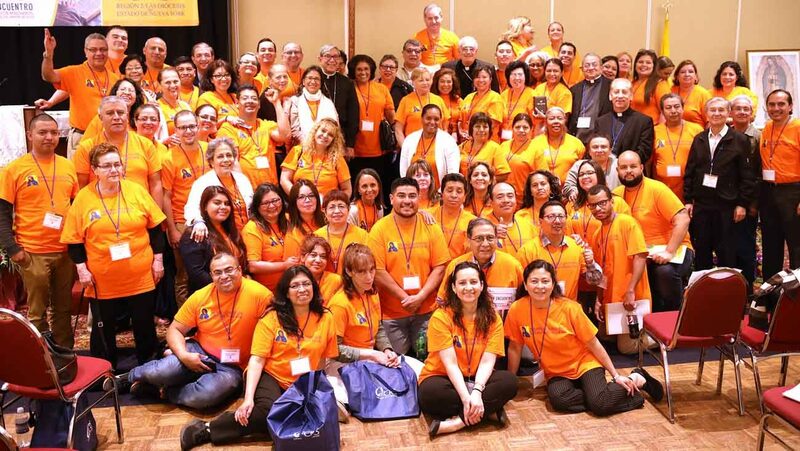 ALBANY, N.Y. (CNS) — The U.S. church’s national encuentro call to Hispanic Catholics to go out to the peripheries and encounter others has energized the country’s dioceses, Auxiliary Bishop Octavio Cisneros of Brooklyn told delegates at the Region II encuentro in Albany. On June 22-24, bishops and about 300 Hispanic Catholic leaders from the eight dioceses of New York state gathered in Albany. This encuentro was one of the last regional gatherings before V Encuentro Sept 20-23 in Grapevine, Texas. Region II includes the Archdiocese of New York and dioceses of Albany, Brooklyn, Buffalo, Ogdensburg, Rochester, Rockville Centre and Syracuse. Before the regional event came diocesan and parish encuentros. Through the encuentros, we are realizing the richness of our faith, our culture and what we can offer to a larger society,” Bishop Cisneros said. Wanda Vasquez, New York archdiocesan director of Hispanic ministry and Region II encuentro chairwoman, said her view of ministry changed as a result of the encuentro. “We can actually build a community of eight dioceses in one region, working together for the same goal: to save souls,” she said. Elizabeth Johnston, a delegate from the Rochester Diocese, said that the impact of the parish-level encuentros is already showing great results. Rafael Villanueva, a Hispanic leader from the Diocese of Albany, pointed out that the needs of parishioners in New York state could vary. Acting as that bridge for his own parish, St. Edward in Clifton Park, he worked with parishioners to celebrate their first bilingual Mass. At the regional meeting, delegates and bishops devoted hours to discerning the challenges, opportunities and priorities in the region, focusing on the ministerial areas that were prioritized during the parish and diocesan encuentros. These included: evangelization and mission, youth and young adults, intercultural competencies, leadership development and ministry formation, faith formation and catechesis, family ministry, immigration and ministries for people with disabilities. The weekend combined intense work to determine the region’s priorities for the next five years along with a joyful sense of fellowship, opportunities for praise and worship and Masses. The faith-filled gathering also showcased the diversity among the delegates themselves. “In western New York, the Hispanic population is mostly Caribbean, but in meeting other dioceses, I’ve seen people from Mexico, Guatemala, etc.,” said Deacon Alejandro Manunta, a teacher at the Hispanic Pastoral Institute in Buffalo. Father Agustino Torres, a member of the Franciscan Friars of the Renewal, represented a small group working on intercultural competencies. He summarized the groups’ finding highlighting young people, devotions and holistic formation. He added that the group agreed on the need to keep alive their faith in a way that celebrates each community’s devotions — as well as organizing multicultural parish encuentros. Saravia and her husband, Cesar, celebrated 34 years of marriage by participating in the encuentro with fellow parishioners. “Each culture has a genius, a chance to unite and not exclude,” said Father Torres, adding that his group suggested regional strategies to better train priests and ministers to accompany Hispanics in their spiritual lives. Good intercultural leaders give hope to young people and to families, making them feel welcomed and encouraged. During his keynote speech, Archbishop Christophe Pierre, apostolic nuncio to the United States, talked about evangelization and communion with God, with each other and with the world. “The encounter with each other in the church should imitate the grace-filled encounter we have with God,” Archbishop Pierre said in Spanish. Acknowledging that everyone has inherent dignity as a child of God, he said that encounters were a chance to appreciate diversity. “This diversity is also the work of the Spirit, who desires unity without requiring uniformity,” he said. During an interview with Catholic News Service and Fe Fuerza Vida, a Diocese of Rockville Centre publication, Archbishop Pierre said that for migrants from Latin America, faith has become the culture due to centuries of being inspired by the values of Gospel.